The company of Orient & Flume was founded in 1972 at Chico, CA, by Douglas Boyd and David Ballentine Hopper. Both had studied with Robert Fritz at San José. After getting their master’s degrees they traveled all over Europe learning and experiencing the old techniques in glass first hand. I suppose their travels are a highly kept secret entered in their diaries only as I have never read about any of their experiences. Being a world traveler myself and having lived in Europe for eight years, off and on I can relate to what a wonderful adventure and learning experience it is. After returning from their travels they set up their first furnace in Boyd’s backyard, which lay between Orient Street and Flume Street hence the company title. Their first pieces were signed with a double B, indicating Boyd and Ballentine. It was at this location that Douglas purchased a historic carriage house and transformed it into an art glass studio. Orient & Flume’s stunning art glass creations quickly became popular and by 1973 the business had grown too large for the small carriage house. The company was then relocated to Park Avenue in Chico where it remains to this very day. 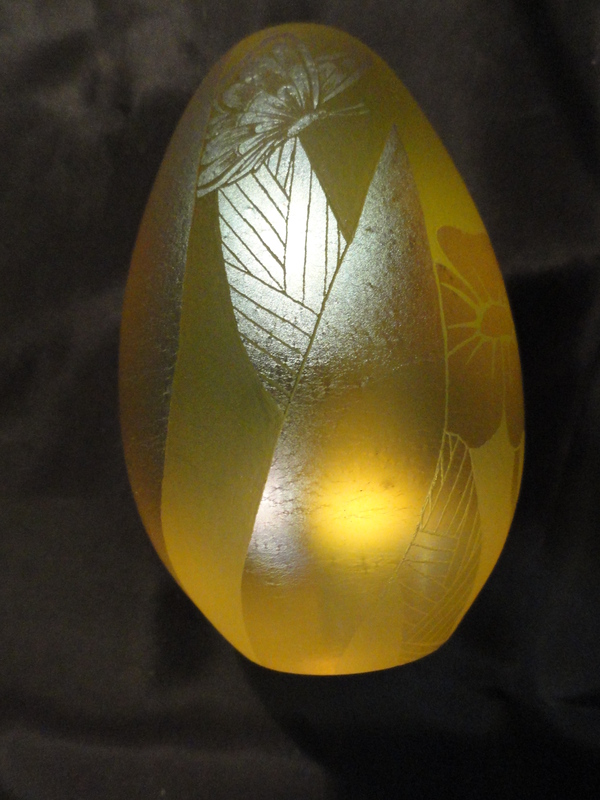 The company regularly drew in other artists with various skills in working glass, including Kathy Orme (a designer who still does sand-carved glass in Chico), Lubomir Richter (a Czech-trained glass engraver who works for Steuben), Dan Shura (an ivory scrimshaw artist now living in Canada), Daniel Boone (a stained-glass artist who now has his own studio in Chico), and Bruce Sillars (a designer and glassblower employed by the company). Orient & Flume specialized in recreating the outstanding achievements of famous American companies, such as Tiffany “cypriote” glass and Steuben aurenes. While the body of their work is largely a riff on American art nouveau, by 1978 they were experimenting with more contemporary styles. 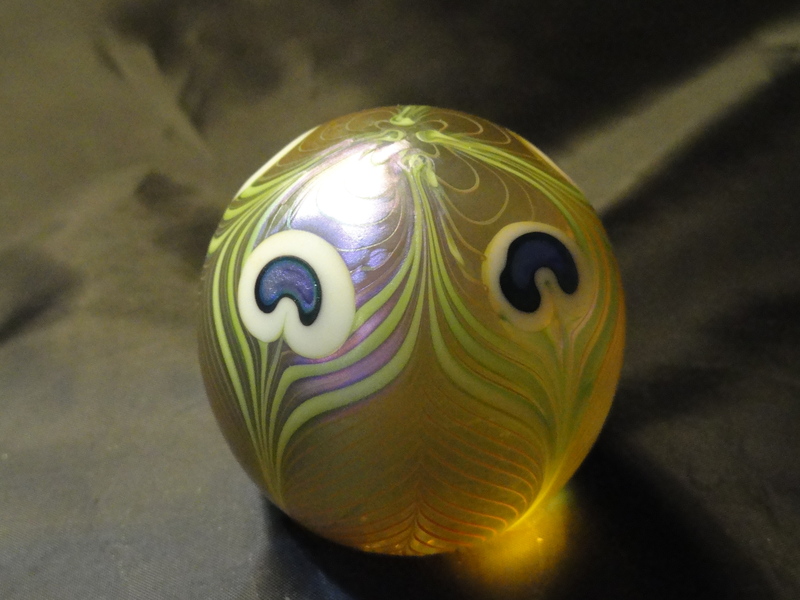 Orient & Flume’s early blown glass creations centered on recreating the iridescent glass pieces made famous by such companies as Tiffany, Steuben, and Loetz. 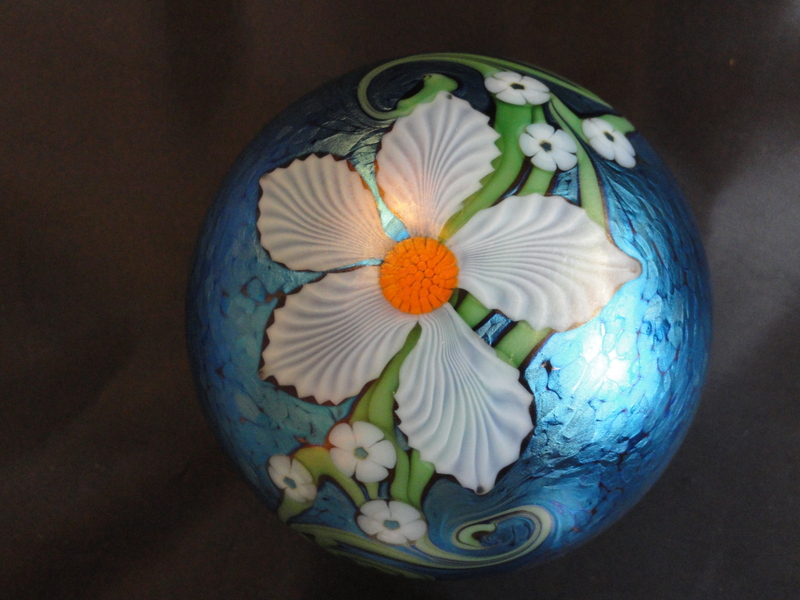 Some examples of the Tiffany or Loetz style paperweights made by Orient & Flume in the 70s and 80s. Over time this evolved into their current creations of three-dimensional designs within clear glass or cased glass weights. 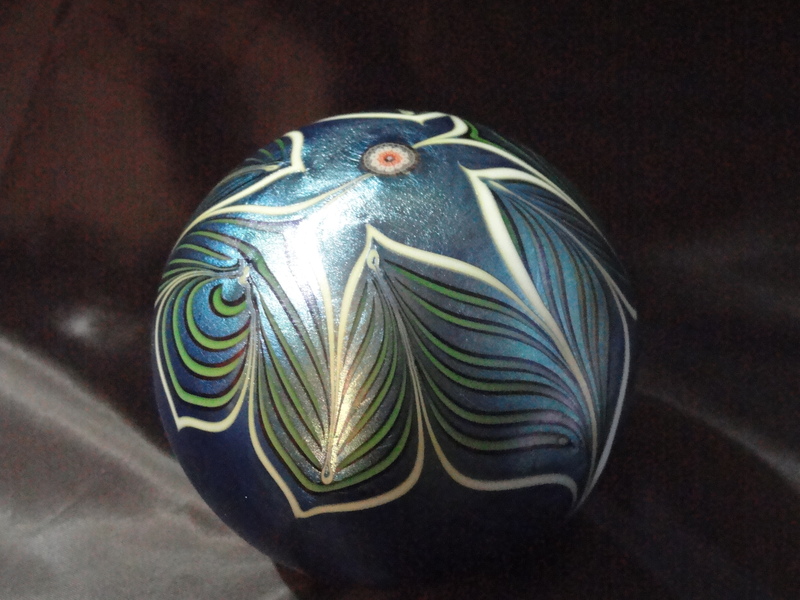 This eye-catching effect is part of what makes their vases and paperweights so valuable among glass collectors. A very beautiful example of the dimensional cased glass work of Orient & Flume. 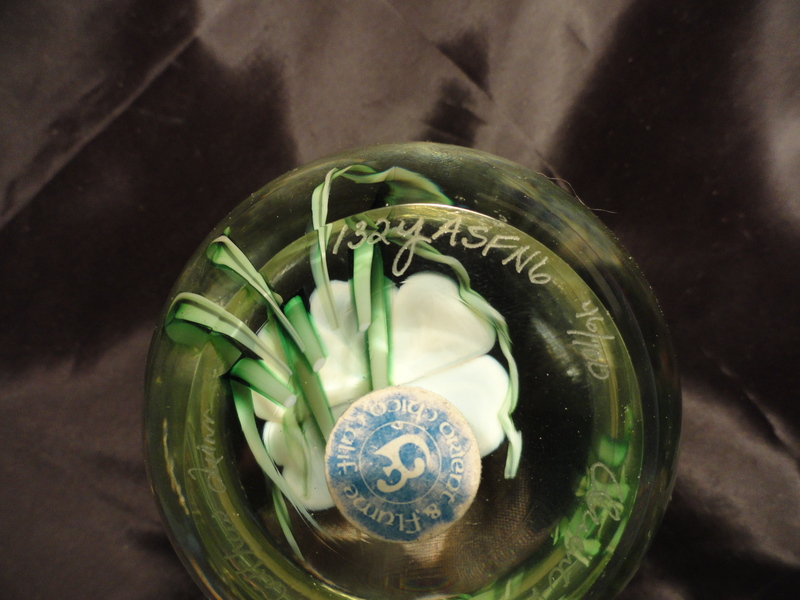 This is a 1984 “Star Flower” paperweight with a OF /84 date cane. 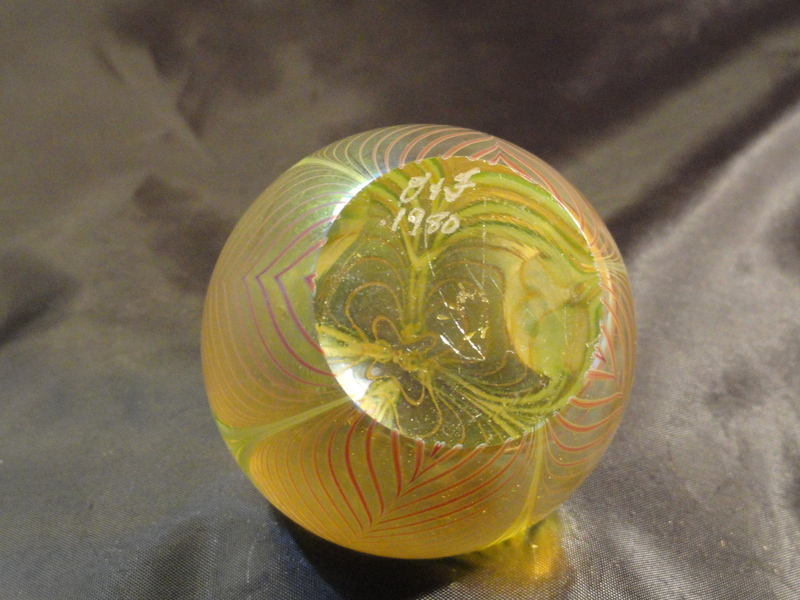 I have only seen the date cane in the 1983 and 1984 paperweights and not all of them for those years have it. Located at 2161 Park Avenue in the small Northern California town of Chico, tucked back from the main road is a world-famous blown glass art studio known as “Orient and Flume”. They are open Monday through Saturday in the showroom from 10:00 am to 5:00 pm. The studio, where you are able to watch some of the glass production, is open Monday through Friday and closed on weekends. 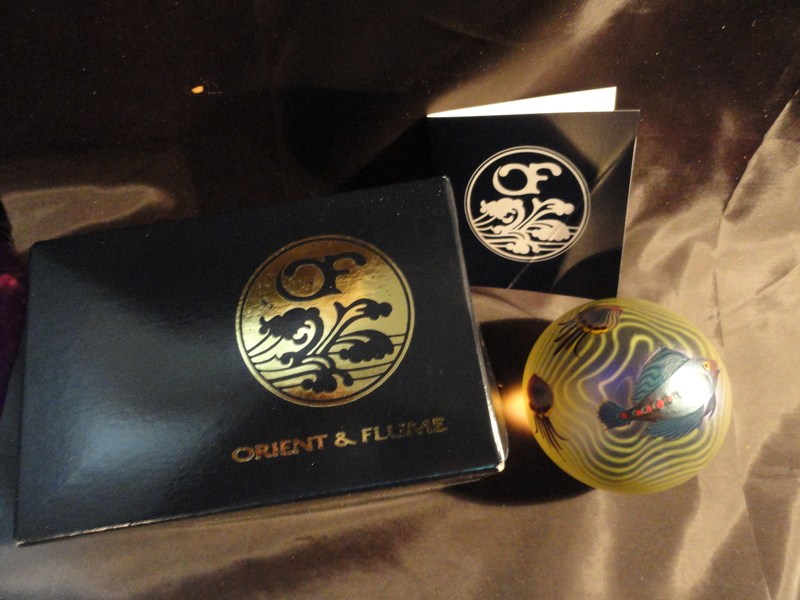 Orient & Flume also has a website where you can buy their creations. The studio is a working studio with a large production facility in the back that accommodates several artists. Located in the front is a small section that contains historical pieces and memorabilia along with a seating area where you can sit and watch a short video on the process of glass making. In the main entrance is a gallery where selections of various works are displayed and sold- from large glass vases to small pieces of original jewelry. The prices for pieces in the gallery range from $100 dollars for a small pendant, all the way to several thousand dollars for a large vase. The process it takes to create beautiful pieces of art is anything but simple. The artists must face a fiery furnace heated to 3000 degrees in order to melt sand into glass. They take a metal punty that is much like a big straw- that is dipped in the hot liquid glass in the furnace. They spin the punty around and pull out a large mass of molten glass that will be pulled, pushed, spun, cut and rolled all the while blowing air into the punty, until the desired shape is achieved. 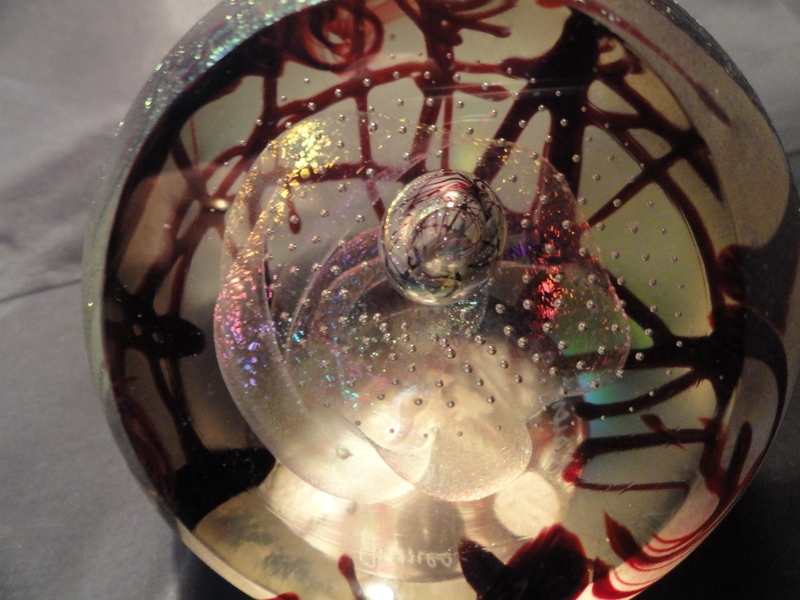 The patterns and colors of the art piece are rolled into the molten glass. There are other techniques that can be employed, but each piece determines the technique used. 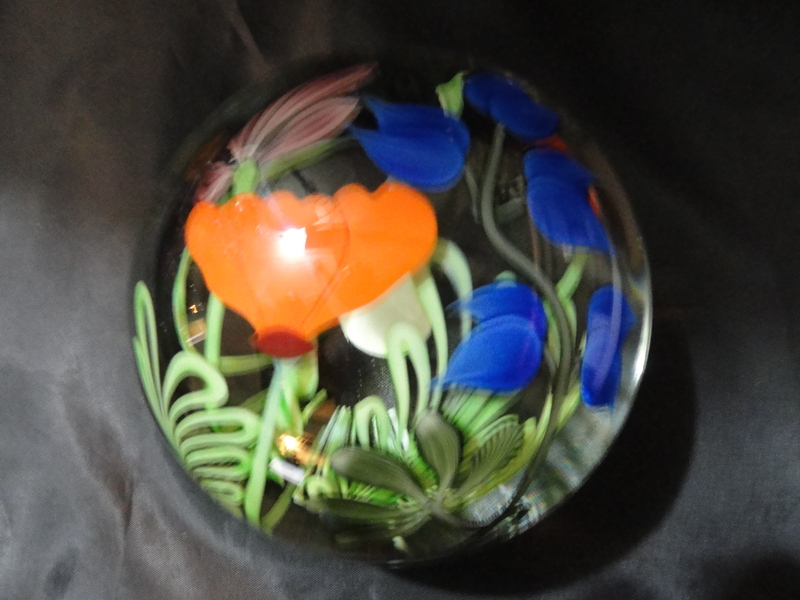 There is a video on the web that is well executed and describes the glass blowing process. The studio currently has five artists who work both on individual pieces and in collaboration with each other. Bruce Sillars is the original employee, having begun his career with Orient and Flume in 1973. 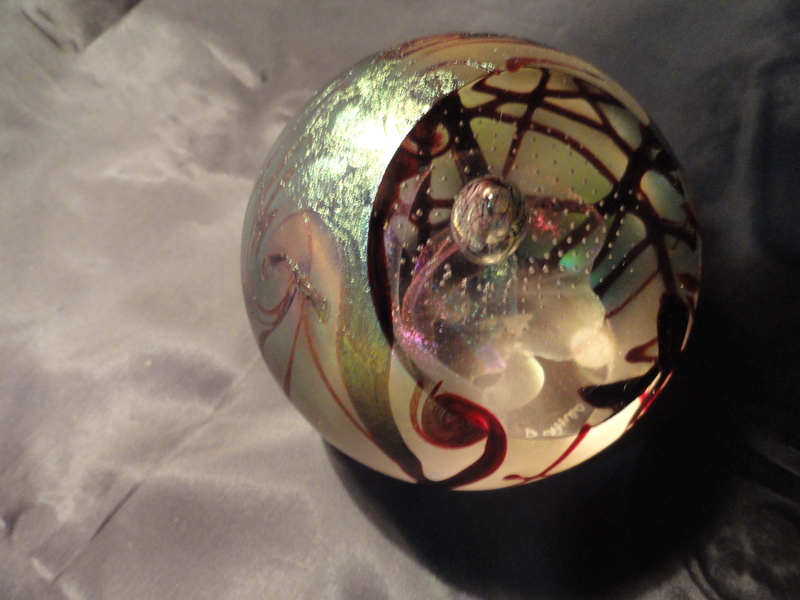 Along with Bruce are four other artists, all masters in the art of glass blowing. Their works are displayed in many galleries around the world. Artists Chris Sherwin, Richard Braley, Scott Beyers and William Carter work individually as well as collaboratively to create the breathtaking works of art produced at Orient and Flume. 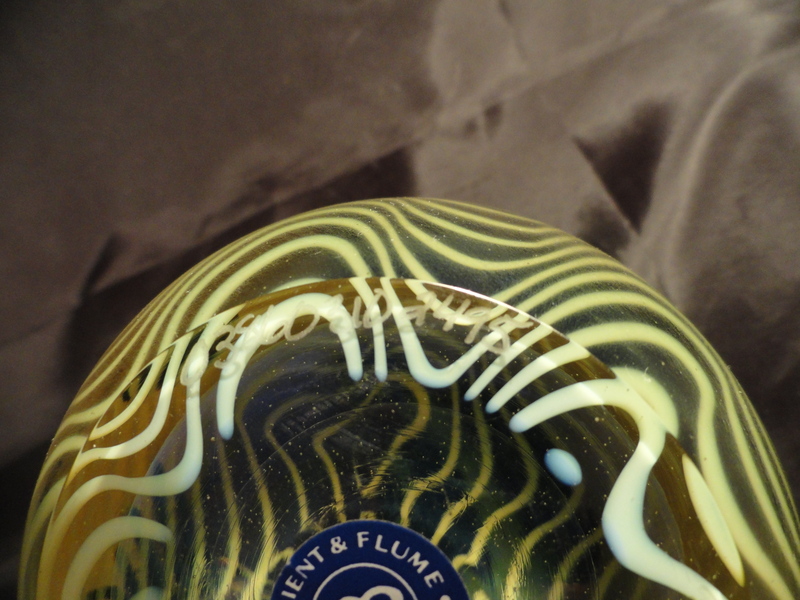 While most Orient & Flume art glass creations do somewhat adhere to a common theme, each artist has the freedom to add their own individual touch and style. Sorry to be the bearer of bad news, but I thought you should know that the O&F signature on a piece of Orient and Flume means that the piece is a second. Top pieces have the full name of the studio. Most people do not know this, but the studio would be the first to confirm it. I collect the peacock feather designs and you’ll be lucky to get around $100 for a top piece and 60-70 for a second. A beautiful petite “Peacock Feather” signed O&F that looks perfect to me! The saying “beauty is in the eye of the beholder” is certainly true in this case. Obviously not every piece is museum quality. 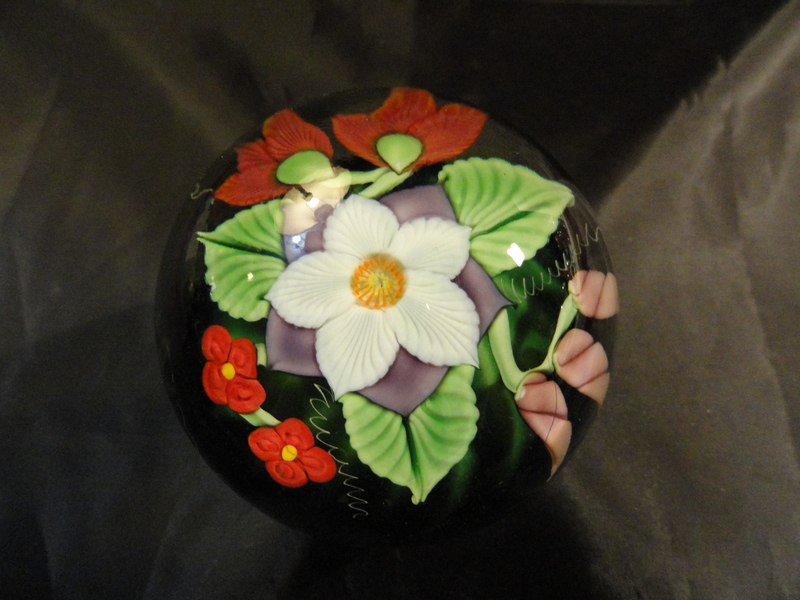 All Orient & Flume paperweights are signed and dated in one way or another. I have tried to describe some of the unusual markings I have found in the exceprts below. 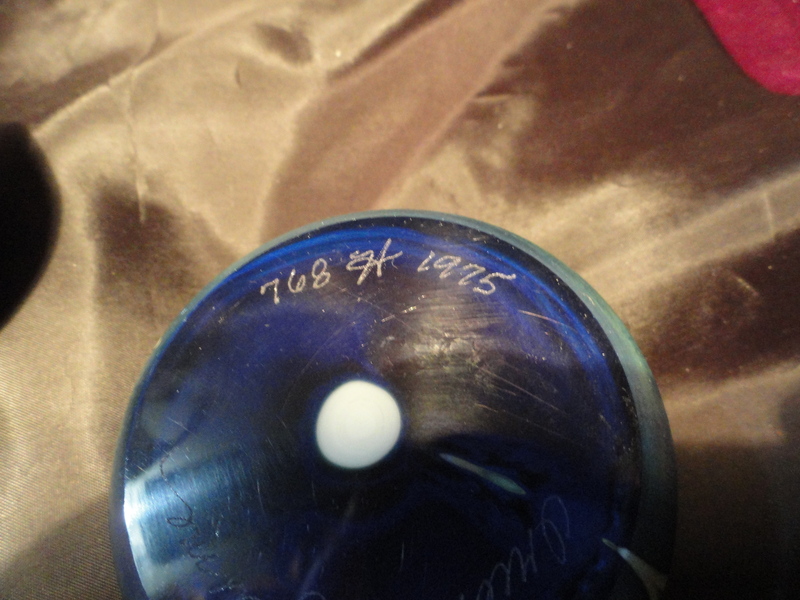 Generally, from 1972 to 1984 the paperweights have the signature, Orient & Flume in script and spelled out if it is not a second. A second just has O&F in script. 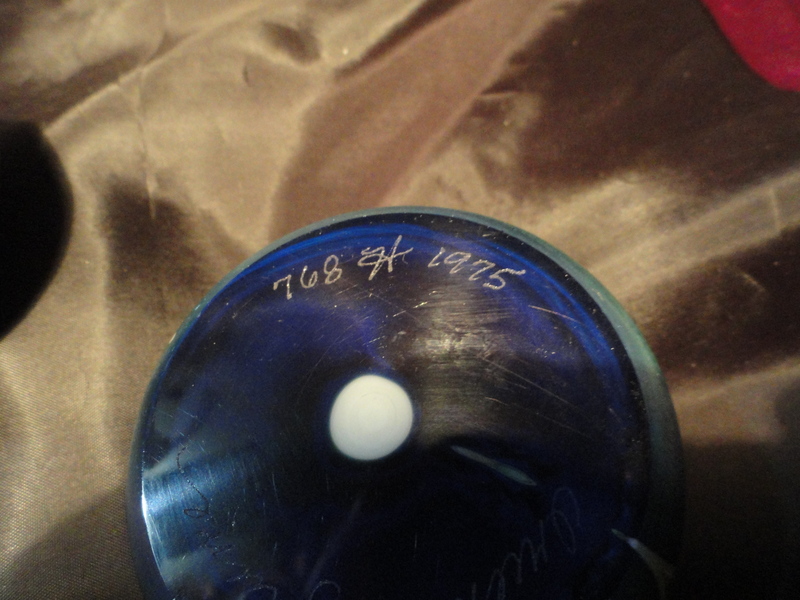 The weights from 1972 – 1984 have the date written on the weight as well, usually on the bottom with the run number ie: 1 of 150 and/or a serial number of some kind. You may also find the artist intials or name spelled out on the weight. 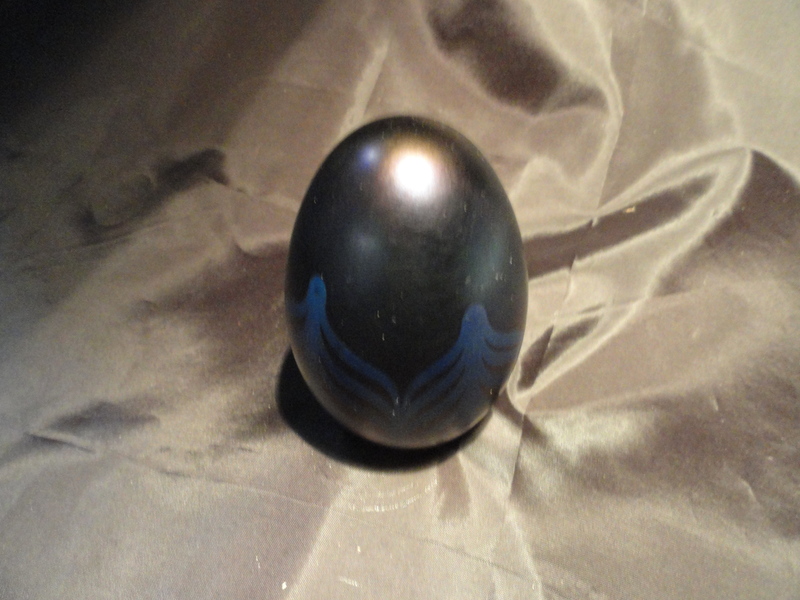 The egg weights sometimes have the same information but written very tiny on the outside base rim. 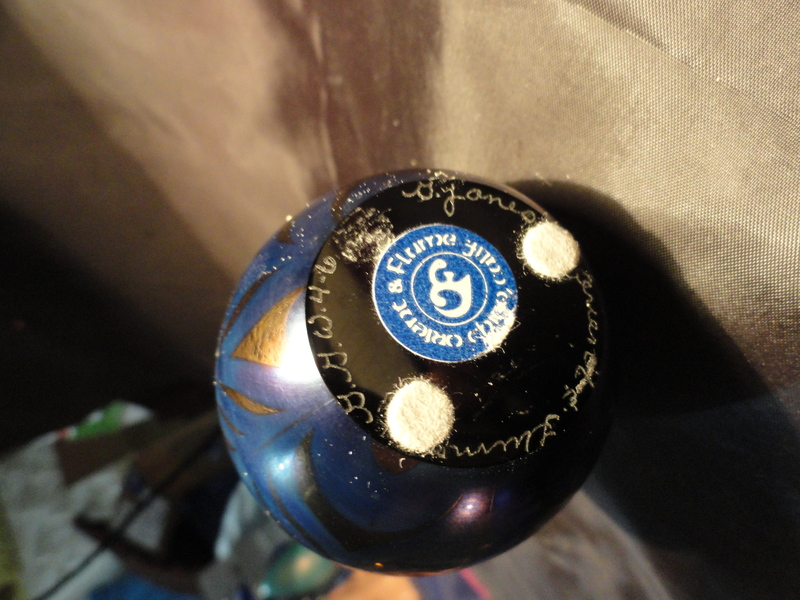 Many of the collectible weights still have the blue and white studio tag. In my opinion this is a plus on weights dated 1985 or newer. The original box and COA (Certificate of Authenticity) also is a plus. It shows that the previous owner took good care of the weight. The weights 1983 and 1984 sometimes have a signature cane with O&F and the last two digits of the year, either 83 or 84. This IS NOT a second. It is in the signature cane only and still signed on the bottom. In 1985 Orient & Flume started marking their weights with a different numbering system. The first letter at the end of the numbers indicates the year using a reverse alphabet starting with Z. So Z is 1985. If you see the number 0715Z this weight was made in July 1985 and is number 15. Their normal run is 500 to 1000 but I have seen a run of as few as 25. Also it is important to know that they skipped the O so N would be 1996. “Oh” what a year that was! Ha ha. The year 2010 does not have a letter so it is anybodies guess what they will mark on the 2011! LE is Limited Edition probably runs of 25, 50 150 or 250. Anything over 250 is most likely not an LE. A vintage 1975 Orient & Flume marked in script. This one simply says 768 H 1975. This one is 768 from a run of 1000 or 2000. 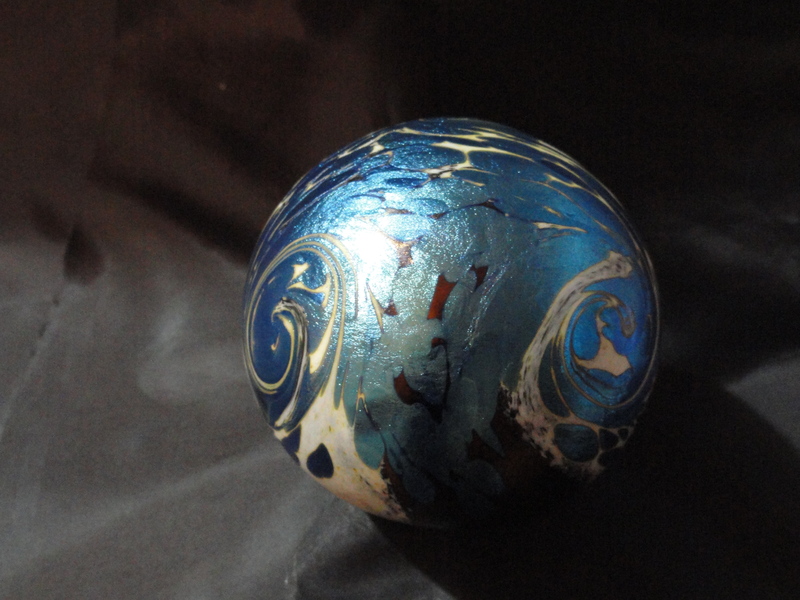 I have some older ones but this one was easy to photograph because of the cobalt blue base. The white dot in the center is the core, not a studio tag. Signed with just the O&F and the date 1982. Someone in charge of production decided this one was a second, although it looks perfect to me. 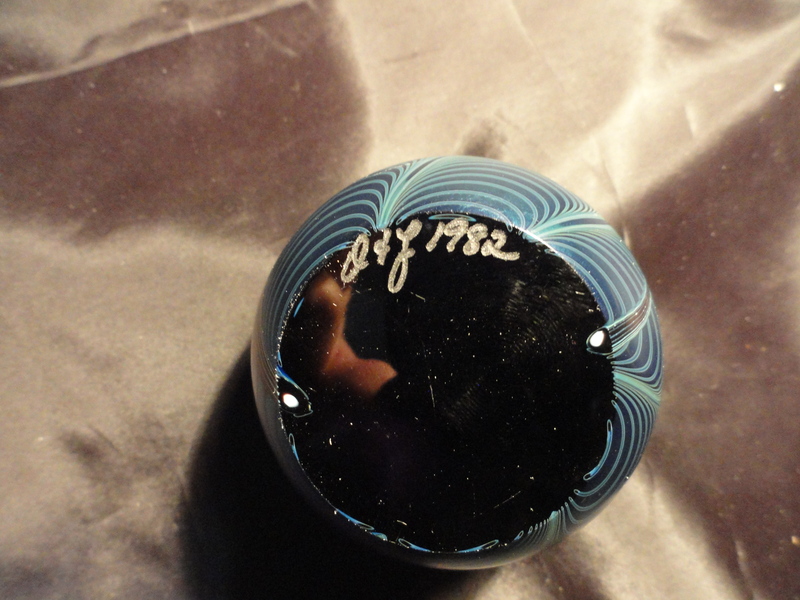 An egg shaped weight signed in script Orient & Flume with the number E51M1978 on the outer edge of the base rim. This one is the 51st made in 1978. 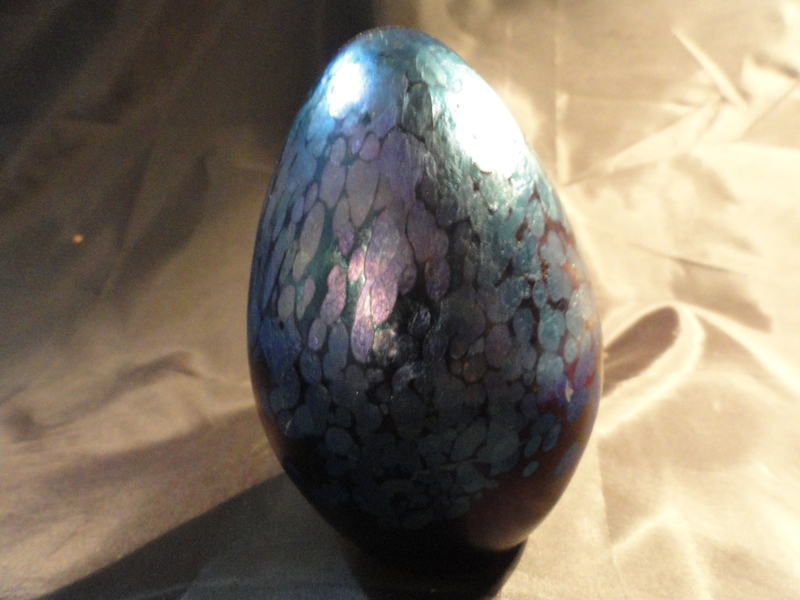 An egg shaped weight but signed on the base. Orient & Flume in script. Artist signature of G. Jones and then G.G.W. 4-6 which means G.G. 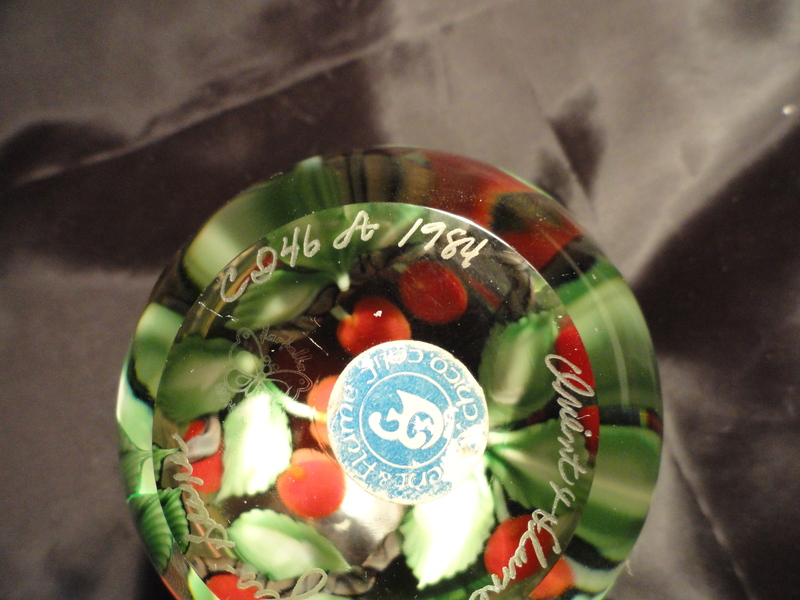 for gift glass made in June 1984. This 1984 has a studio tag (faded), it is signed in script Orient & Flume, has the run and year C246 and 1984 and the signature cane (2nd photo) O&F 84. Also has the artist signatures of Beyers and Seaira. Again, a faded studio tag. 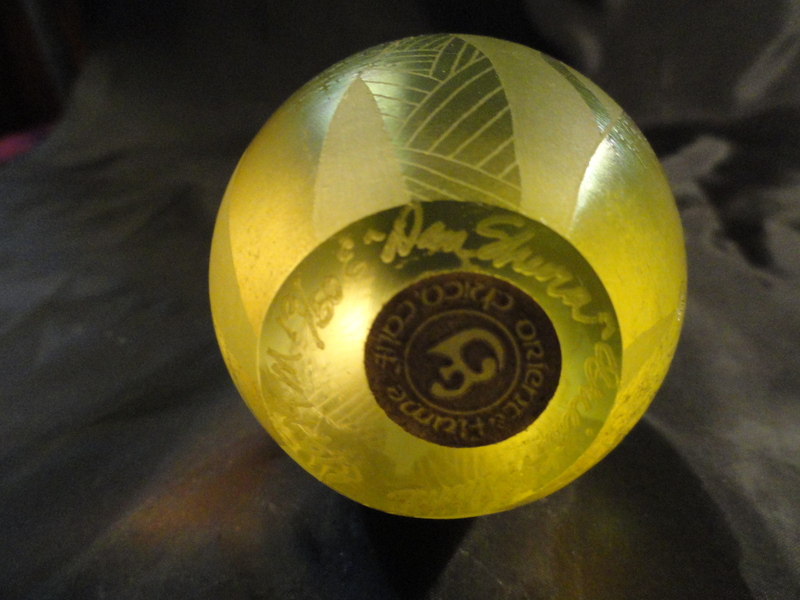 This paperweight is signed in script Orient & Flume and also signed by the artist, Matthew Quinn and has the run number as 46/100. The date is under the system started in 1985. The number as written is 132yASFN6 so this one is the 32nd made of 46 in Jan 1986. Remember that it is the first letter in the string which in this case is y or 1986. Also just a note that they wanted to make 100 that doesn’t mean that they did. 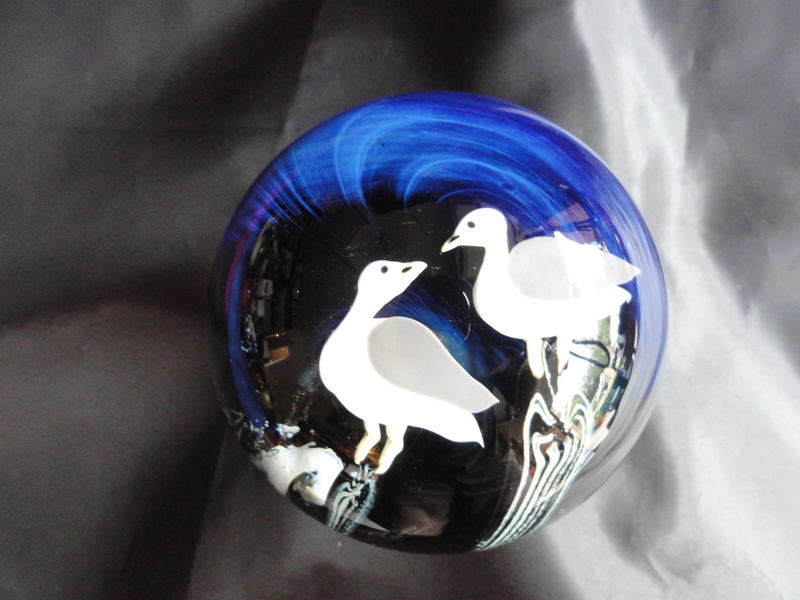 You will find this often in European paperweights such as Baccarat and Caithness. Maybe they made the whole run and maybe not but in Jan 1986 only 46 had been made. 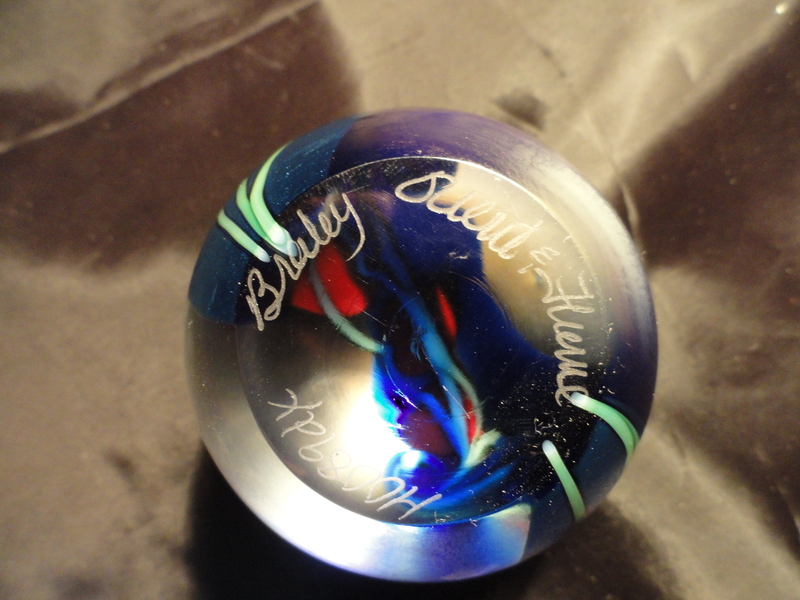 A colorful “hanging hearts” weight signed in script Orient & Flume, artist signature of Braley and the numbers MOO89dx. Made in August 2006. This one is number 9. Brand new, just unpacked. Interesting that the studio tag sits in a little recess in the base so that it doesn’t get worn or damaged! This one is signed Orient & Flume in script, signed by the artist Beyers and the number is 038603102495, made in March 2010. There are no letters. Just the numbers. This one has the box, felt bag and COA. The description on the COA is “Gold Iridescent Deep Sea Life”, Designer: Scott Beyers. 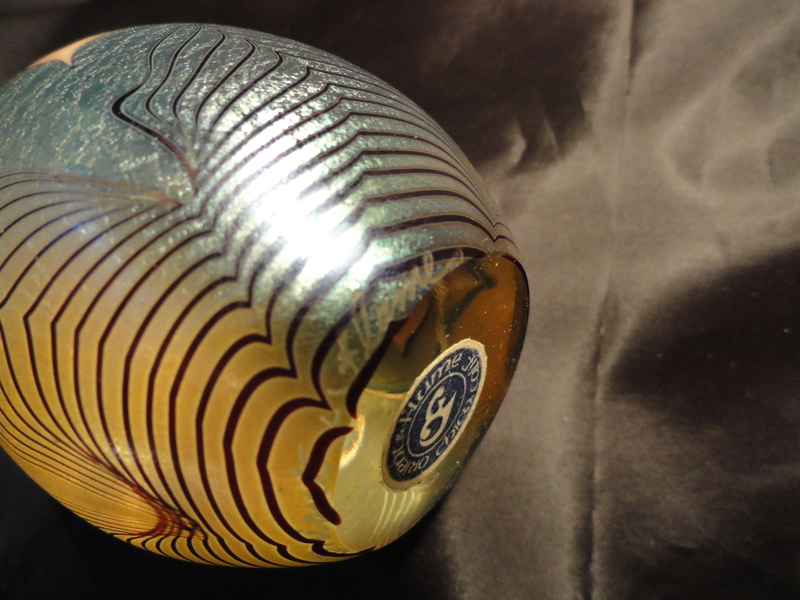 Bruce Sillars – is a prolific designer considered by other glass blowers to be a true master of glass technique. Sillars grew up in the Los Angeles suburbs. In high school he worked in ceramics, later becoming a technician in the ceramic studio at Moorpark College. He holds a BA degree in Art with an emphasis in ceramics, glass, and sculpture from California State University, Chico. 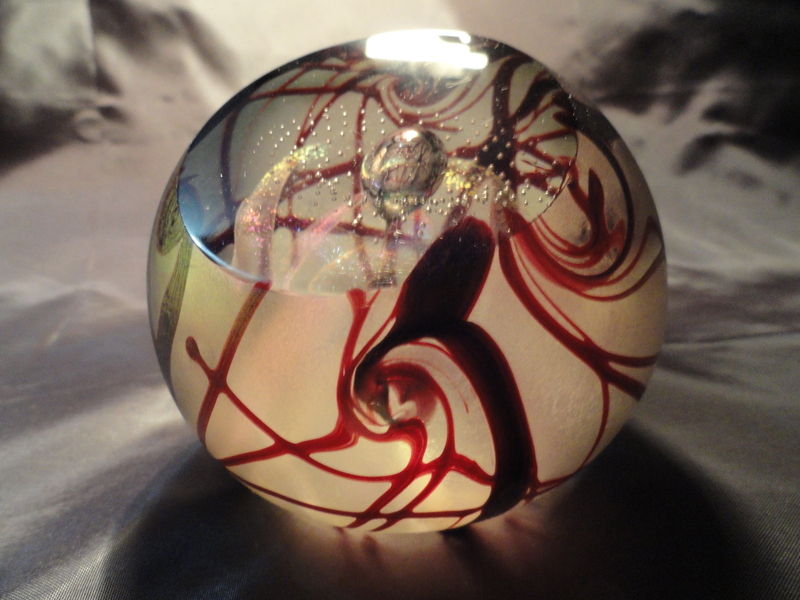 Scott Beyers – A master glass artist, Scott is known for his graceful, free-flowing designs achieved through the expert use of “torch worked” techniques. Through his extraordinary finesse with these most difficult techniques, his work displays motifs that display the most delicate of lines, sensitive colors and sense of movement. William Carter – A superb glass artist William is fascinated by the idea of hot, molten glass being manipulated to form art pieces that, when finished, end up so cool and smooth to the touch. He has a special talent for torchworking, or the application of designs on hot glass using a hand torch to melt colored glass canes. Most of his designs are drawn from nature, often including flowers and foliage. Richard Braley – Music and art both influence the independent personality of Richard. Richard was always getting into trouble for drawing, ever since kindergarten. In high school his art took form through his favorite subject, wood shop. But his introduction to art glass came through a three-year independent study program at Central Washington State in glass blowing. Jeff Howell – A glass engineer, designer & artist, Jeff Howell received his Bachelor of Arts degree in Organic Chemistry from the University of California in San Diego and his Masters from UC, Santa Barbara in Physical Chemistry. He became interested in art glass, while manufacturing chemical instruments and performing the task of scientific glassblower, which dealt with distiller apparatus and test tubes. He worked in art and design for decades, meeting his wife Cathryn while in a college art class. 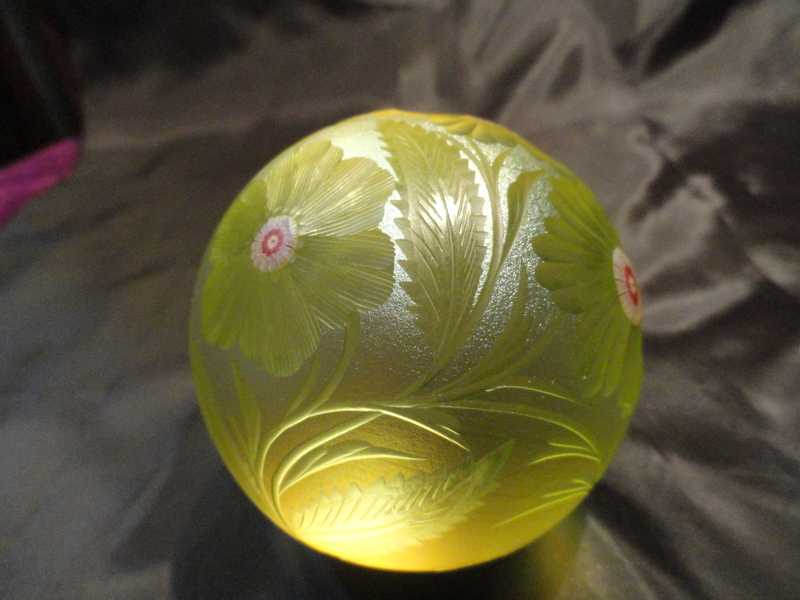 For many years he blew and decorated glass in his own studio and for Orient and Flume. In 1985 he joined Cathryn to design and make pottery at their home studio. Until his passing in 2003, these two artists collaborated on many pieces while at the same time working on their own independent projects. Smallhouse, David – Started with O&F in 1980 and was there for 21 years. Did a lot of work in design with Ed Alexander. Now has his own studio and there is even a Smallhouse Glass Collector’s Club with a lot of good info about David’s past and present work. 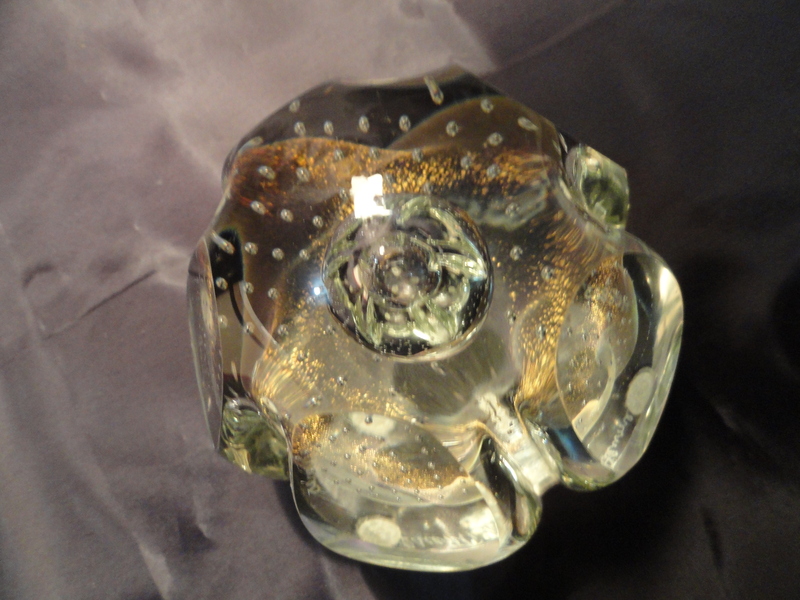 He is pretty well-known for his whimsical and colorful octopi and frog paperweights. A 1991 Orient & Flume large hand cooler signed by Smallhouse. This is an interesting marking, GGW4-6 which means GG for Gift Glass, 4 for 1984 and 6 for the month of June. Signed by G. Jones. A vintage Orient & Flume weight for sure. Quinn, Matthew – I don’t know much about Matthew Quinn. I have only seen his signature on a few weights over the years. Signed Matthew Quinn, Limited Edition 46/100. Alexander, Ed – Now retired from Orient & Flume so hold onto your Alexander weights. They soon will be harder to find. A magnum paperweight. Perfect! Signed by Alexander. Held, Gregg – a senior artist at Orient & Flume in Chico, CA, died on November 14, 1999 of a heart attack while working in his yard. 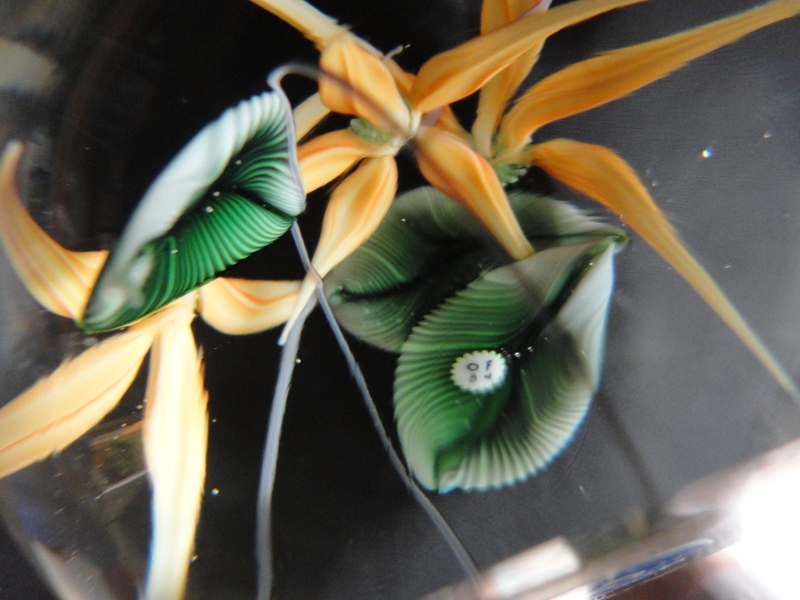 He was only in his mid-forties and it was a great loss to lose such an accomplished glass artist at such a young age. Signed G. Held 1983. Museum quality. Absolutely MINT condition. Seaira, Ed – aka Ed Alexander, artist can sometimes be a strange breed. Joe Morel – This is one of the last pieces made by Joseph Morel at Orient & Flume. 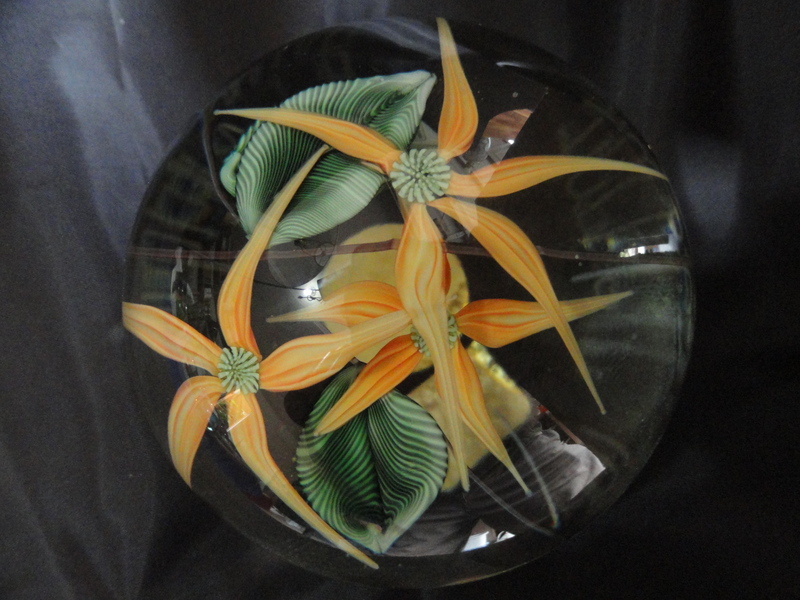 As a founder and Master Art Glass artist extraordinaire, Joe was working at Zellique Studios in 2004. 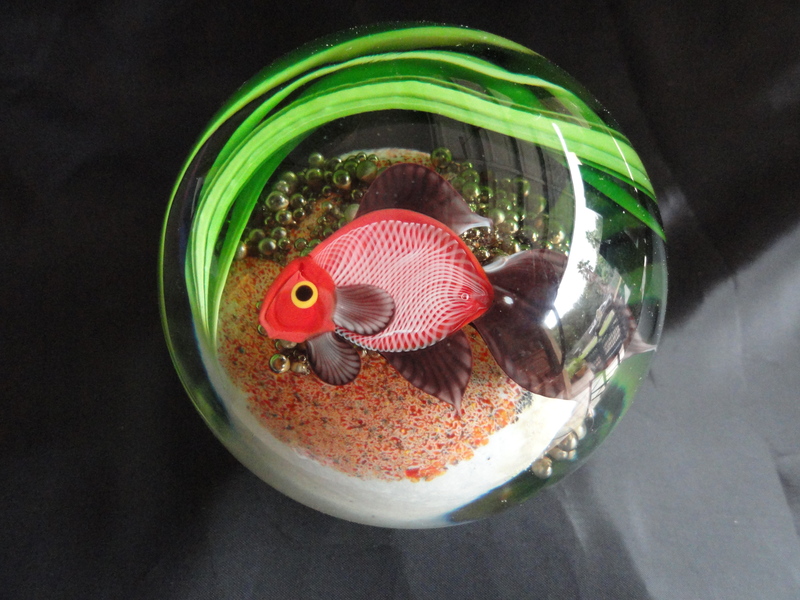 I have purchased a number of his paperweights over the years. Now that he has retired, these pieces have been even more in demand than when I purchased them, and I would expect the demand to continue to increase. Joseph Morel’s impeccable attention to detail is represented in the finest galleries, museums and private collections throughout the world. 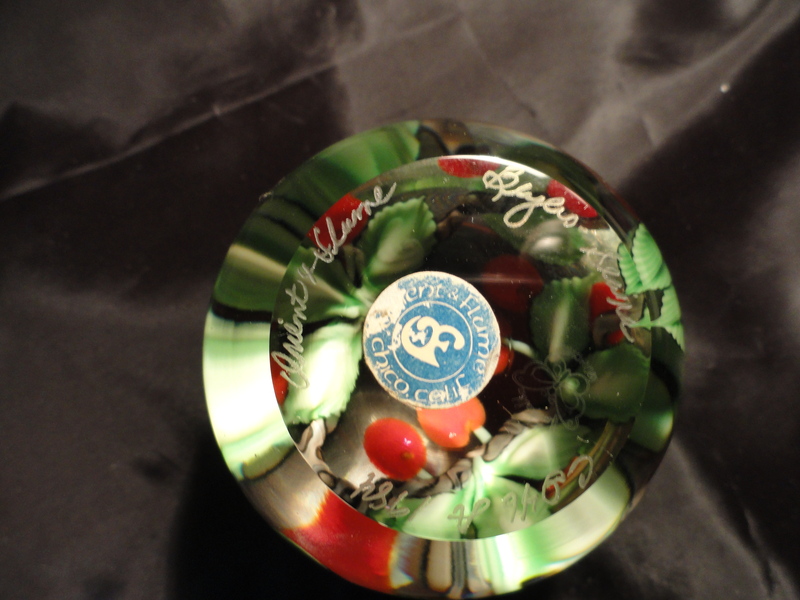 Each piece of his glass art is signed, registered and dated. Wallace James– Wallace learned to blow glass at Shasta College in the ’80’s, in Redding under Clif Sowder, who taught there for 30 years. 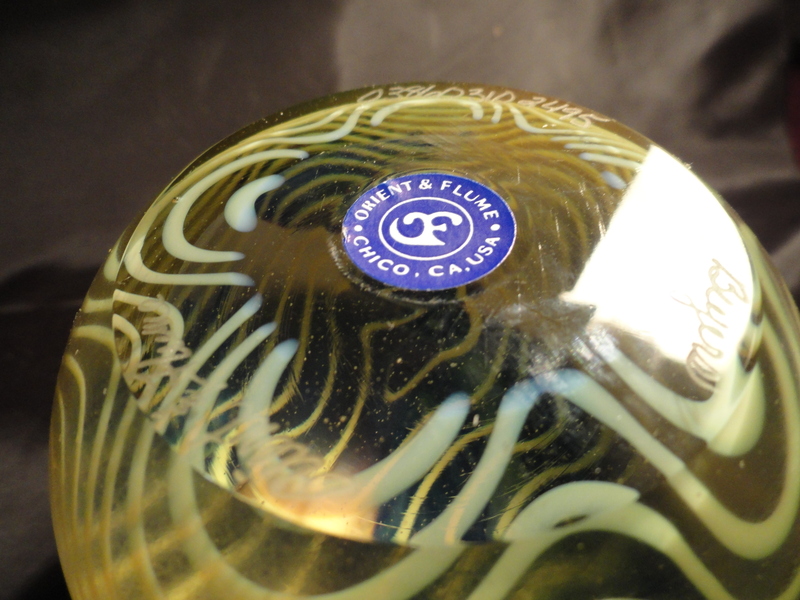 He was also involved in putting together a studio with a couple of other guys, in Montgomery Creek Ca., one was Marty Hook, who owns Sumo Glass Studio now. He got on at O & F in 1988. He worked with Ed Alexander, Scott Beyers and those guys. After 3 or 4 years, he opened his own studio, called W.E. James Company in Redding, Ca.. 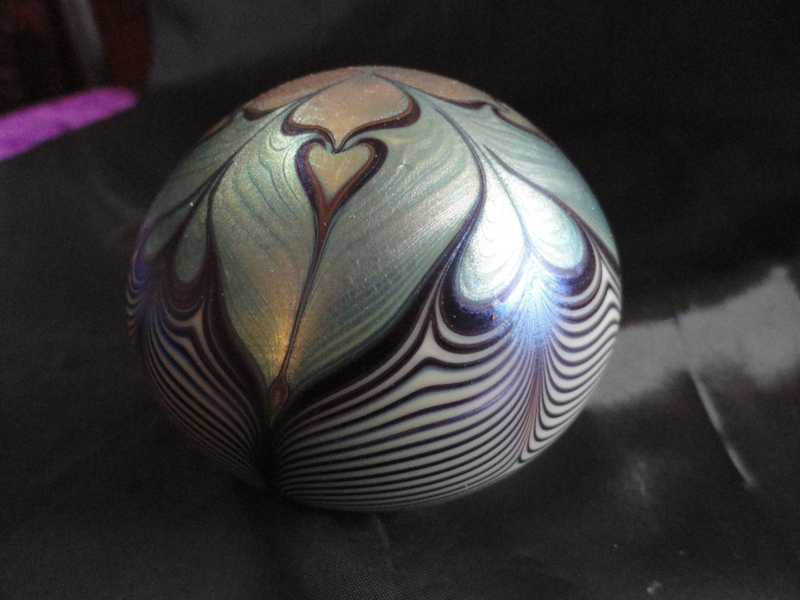 He was most well-known for the “Zenith” design paperweight, which he sold all over the country & quite a few to L.H. Selman, for his catalogue. When he was at O & F, they really teased him about that design, saying it was too simple, etc., however, after Wallace passed away in 1996 (age 34, heart attack), the guys at O & F starting making all kinds of them, realizing they could sell a ton of them! 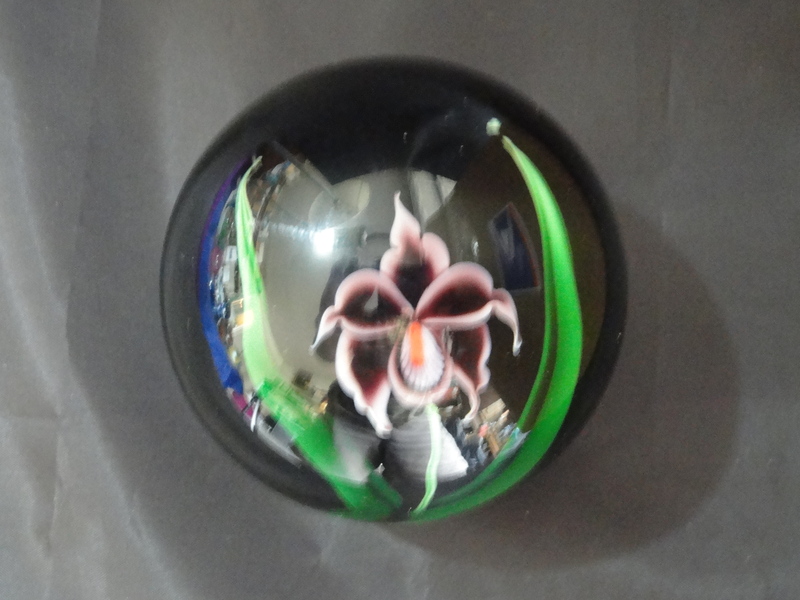 The paperweights made and signed by Wallace James and Orient & Flume are hard to find. I have two of them. Sandy (James) has some of his earlier Orient & Flume weights for sale on eBay. A good investment for O&F collectors as these weights are limited. I wouldn’t pass them up, they are truly unique and excellent weights. Over 2.3 pounds of polished glass. Signed Orient & Flume, an original creation by Wallace James, registry # H08825. Made in 1988 . The number indicates that Wallace intended to make 25 of this particular weight, however this was advertised by the original owner as one of a kind. So….maybe he made more and maybe not. It is a beautiful weight. In 35 years of collecting I have never seen another Orient & Flume weight like it. Filled with gold dust! WOW! This is just such an amazing paperweight I can’t hardly describe it. I was just thrilled when it arrived in the post and I unwrapped it. Made by Wallace James in April 1988 for Orient & Flume. A large weight at 1 lb. 15.6 oz. Registry #HO884S5. This one is one of a kind although the registry # indicates that Wallace intended to make 5 of them. 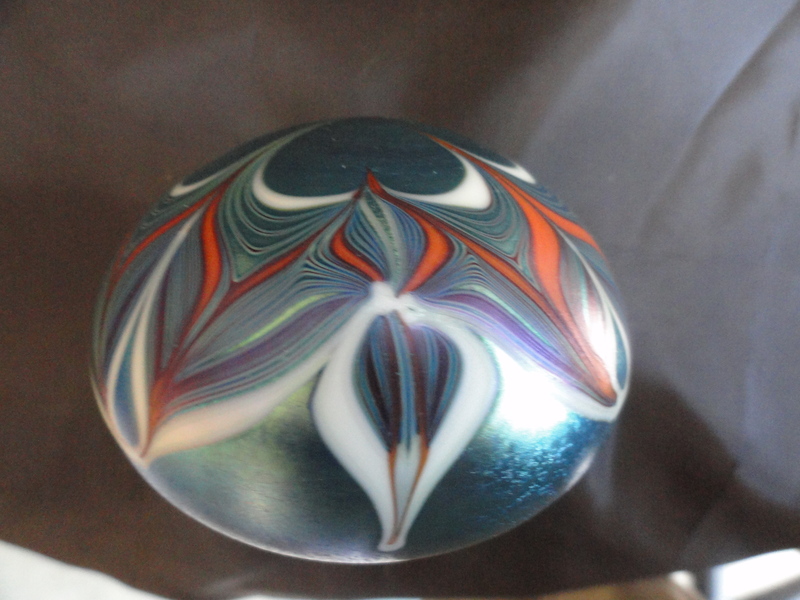 The colors inside this weight just blow me away! 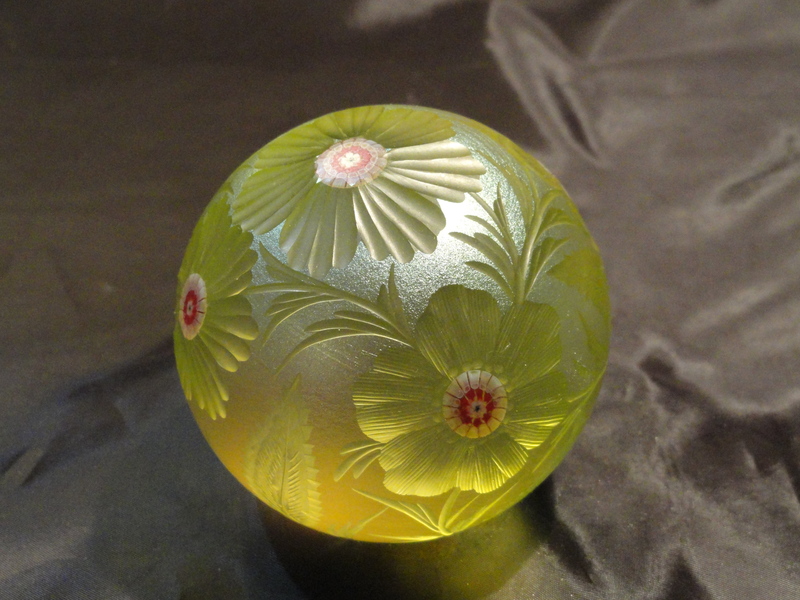 Wallace James, rest your soul, I just love your paperweights, they are anything but simple. Jon Dewitt – Jon was born in Panama in 1952 and presently resides in the state of Washington. He has an impressive “Curriculum Vitae”. Working with glass since the late 1970’s, Jon DeWitt has established his artistic presence through gallery representation across North America. His work is featured in several well-established public and corporate collections, including the Microsoft and Boeing collections in Washington and the Di Rosa Preserve in California. His sculptures have been the focus of articles in the publications, Glasswork Magazine, Glass Art Magazine, American Craft and the French Revue C’eramique & Verre. He was an instructor at the Pitchuk Glass School in Stanwood in 2009 and is currently a visiting artist at Southern Illinois University in Carbondale IL. 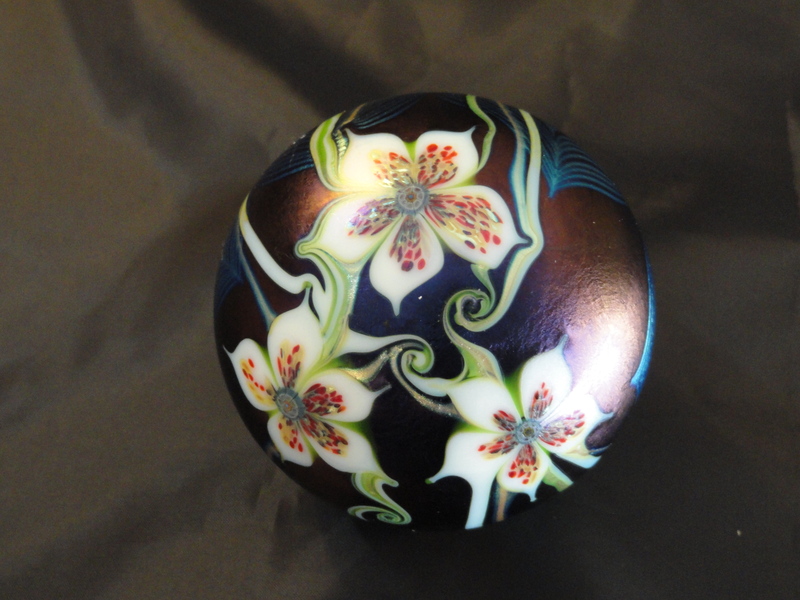 Dan Shura – Dan is a scrimshaw artist and used his skills to make the most beautiful of the Orient & Flume weights. On the O&F website are currently two great Shura weights for sale, a fox and a wren; $2500.00 and $3000.00 respectively. So if you ever have the opportunity to purchase one of Dan Shura’s PWs at a reasonable price I wouldn’t pass it up. It is a great investment and would make a vast improvement to any PW collection. 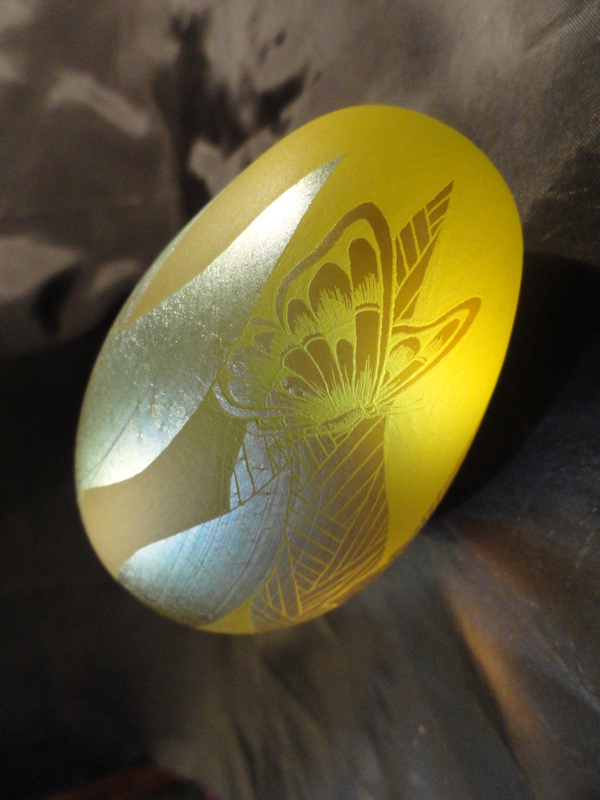 A Dan Shura weight “Butterflies Among Leaves” . Made in 1979. This one is #19 of 50. It is damaged with a tiny nick 1/2″ up from the base. I hope the other 49 are perfect. I am holding on to this one until I can find a nicer Shura in mint condition without paying in the four digits for it. Good luck with that! Roberta Eichenberg – After obtaining a Bachelor of Arts degree from California State University at Chico, with an emphasis in glass, she went to work for Orient & Flume. She was a part of the production team and designed for their product line as well. She received her Master of Art from California State University at Chico, which became a launching pad for her future research. Roberta received a teaching assistantship at Ohio State University where she studied under Richard Harned and earned a Master of Fine Arts degree. 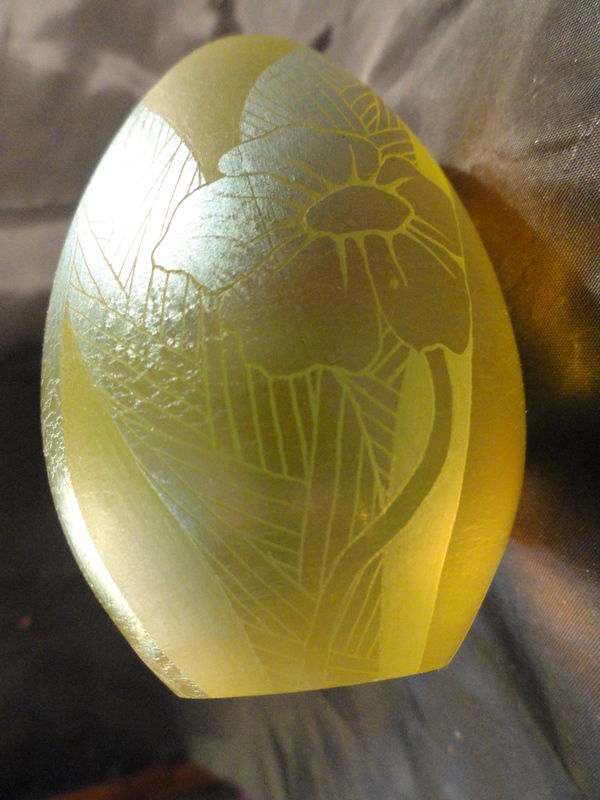 The next year she took a position at the internationally renowned Pitchuk Glass School in the Northwest. She was Studio Coordinator for three years and Educational Coordinator for the last year she worked at Pitchuk. 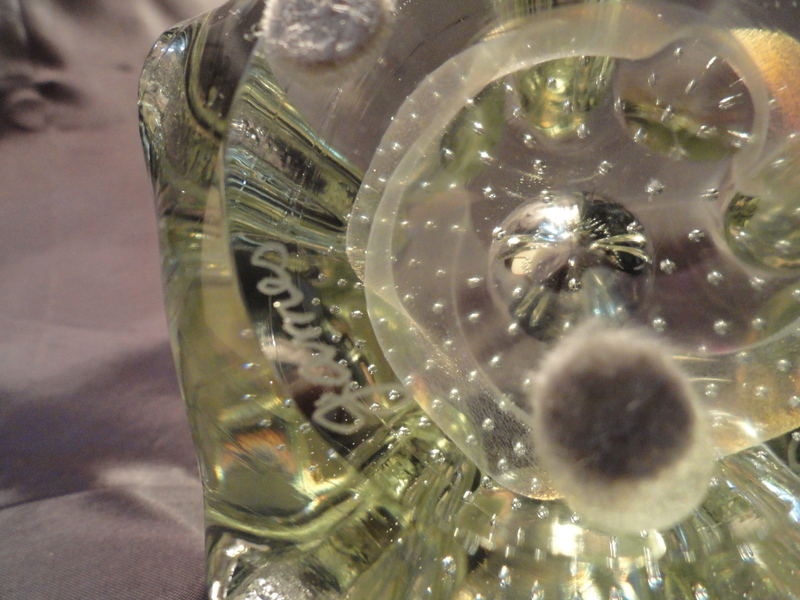 Roberta was selected for the Emerging Artist in Residence program at the Pitchuk Glass School. She relocated to New Orleans LA where she taught at Delgado Community College and established her own studio. In 2000, Roberta relocated to Emporia Kansas and is teaching in the Department of Art at Emporia State. She is currently an Assistant Professor of Art at Emporia State University, teaching sculpture and glass, producing work and continuing to exhibit locally and nationally. From a Reader of the blog the following names were submitted: Thanks Louis. Also worked for Orient & Flume was Chris Buzzini, Marialyce Hawk, Lubomir Richter, Daniel Boone, Chris Sherwin, Richard Satava also known as Richard Gibbons. And others when I remember I will email. From a Reader of the blog the following names were submitted: Thanks again Louis. Keep up the good work! Also worked at Orient & Flume were Alan Iwamura, Bryon Sutherland, Pete Howell, Steve Beyers, Valerie Surjan. More to come when I remember. 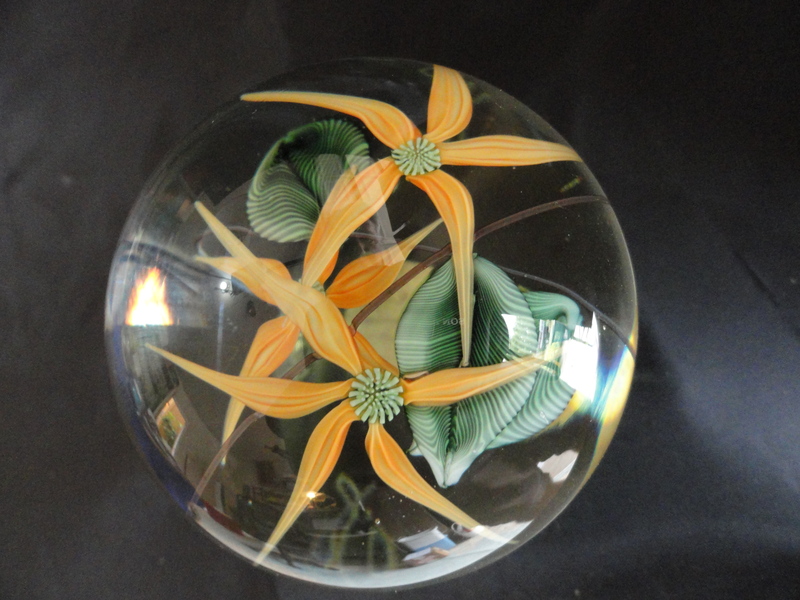 Sam Stergeon – Sam worked for Lundberg Studios, Orient & Flume and other glass studios primarily as a faceter or cutter however, he did make some paperweights on his own from time to time (very few). He formed his own company called Glass Works Studio but stopped working in 1992. His life’s work was cut short by a debilitating stroke which he never recovered from. 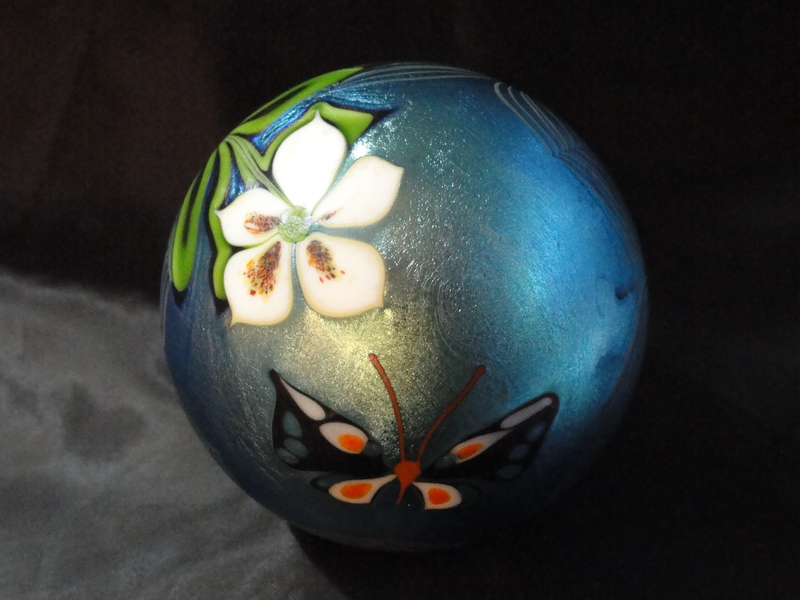 Sam’s work can be seen in museums throughout the world where exhibited but owning a Sam Stergeon paperweight will be difficult as they are a rare find and expensive. Currently at the O&F website there is a weight done by Sam, asking price is $1000.00. Lubomir Richter – A Czechoslovakian, Lubomir did some nice engraving work for both Lundberg and O&F studios. 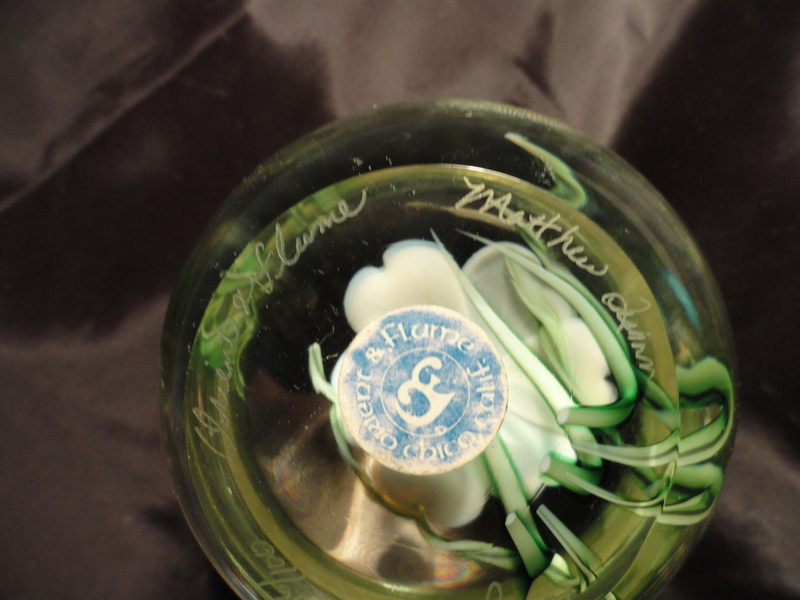 He worked for the Steuben Glass Co. for many years. The most recent and welcomed addition to my personal collection. 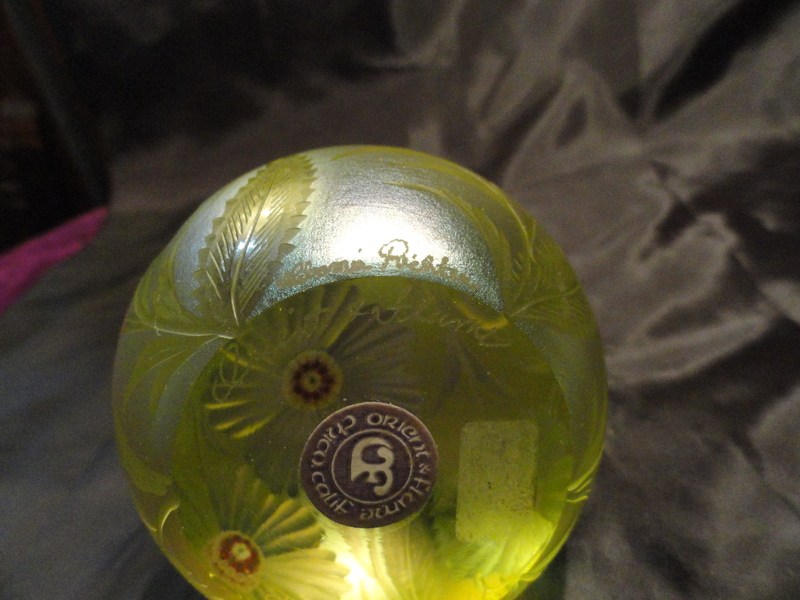 A wonderful 1982 etched glass weight created by Richter for Orient & Flume. Signed and dated. I like this weight because of it’s Victorian design. The other Richter weights I have seen that are the same color as this one have the following carvings on them. A bear and cub, a dragon, nesting eagles and one with butterflies and plants. There are additional weights of different colors and different designs. It is the ones marked Orient & Flume that I am interested in. 10 Years of Orient & Flume: 1974 to 1984 ( A short video of O&F weights in my collection, one for each year). 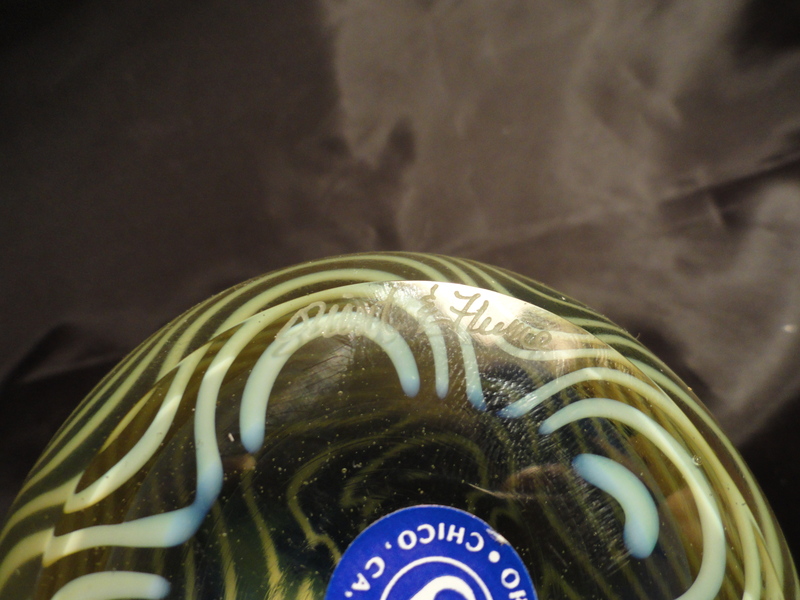 Orient & Flume’s art glass works can be found in the permanent collections of the Smithsonian Museum, the Chicago Art Institute, the Metropolitan Museum, the Chrysler Museum and the Corning Glass Museum. In addition, they can be found in numerous private collections (my own) and galleries. 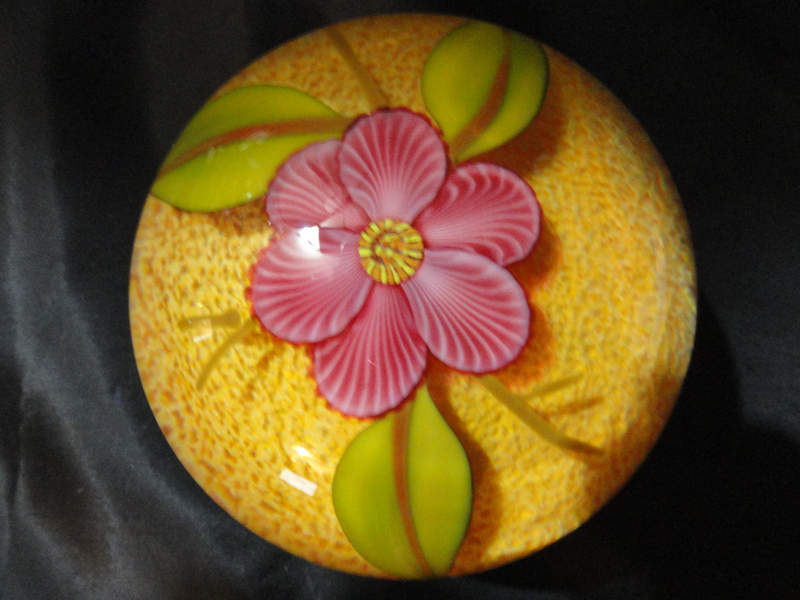 Their beautiful works are admired and respected by glass collectors worldwide. 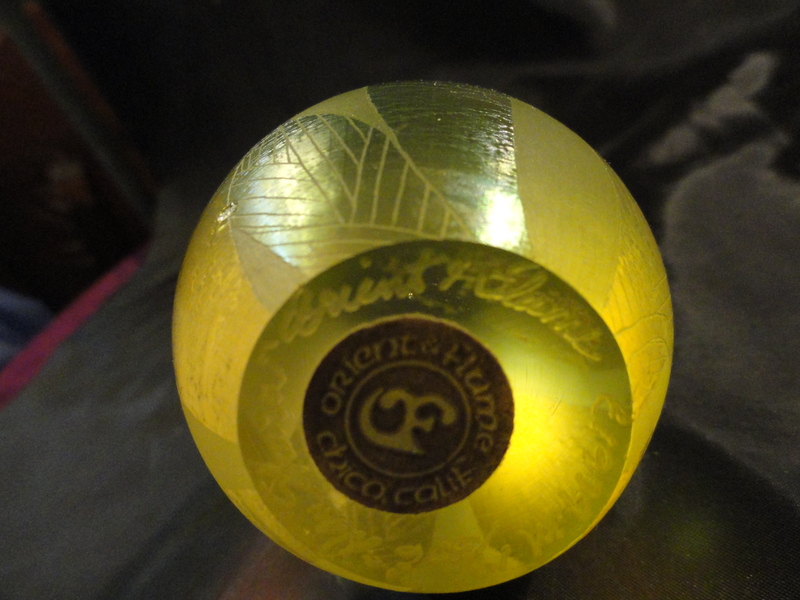 As far as I know, there is not a book that has been written or an in depth history of Orient & Flume so it is just a guess about the many artist that have contributed to the O&F glassmaking fame. 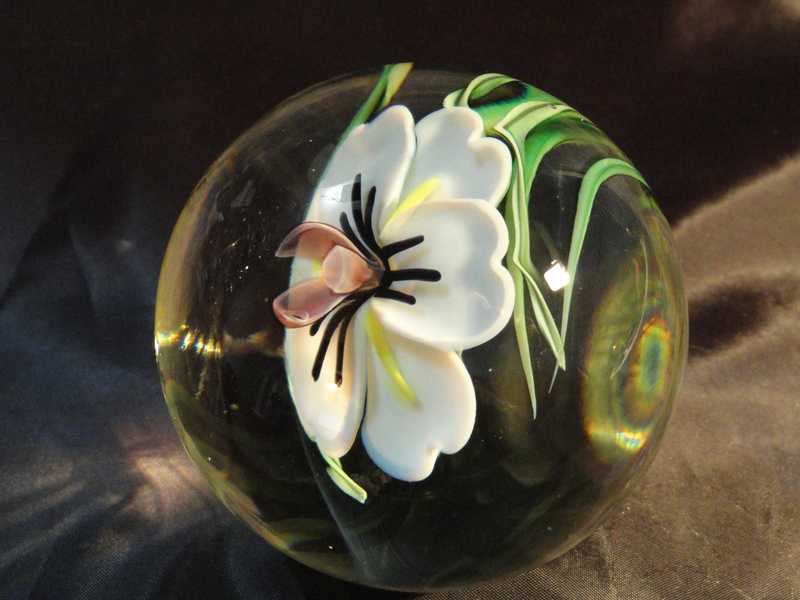 However, when I come across a paperweight, vase, perfume bottle or whatever with Orient & Flume on the piece I look for the artist name. If it is new to me I add them to my list. If you know of an artist that worked there and is not on my list then shoot me an email, I would be happy to add them. A photo of the piece would be nice but I wouldn’t add it to my post as I only use photos of pieces I own or have owned. Sorry. What I would really like to be able to do is list the artist name and the years they worked for (or produced) Orient & Flume. That would be awesome info for us all! That’s it for today. I will continue to research and work on this piece until I have it to my satisfaction before moving on. So…until next time “Happy Collecting” and remember “the best is yet to come”. Click on my Assistant to go to my Store. 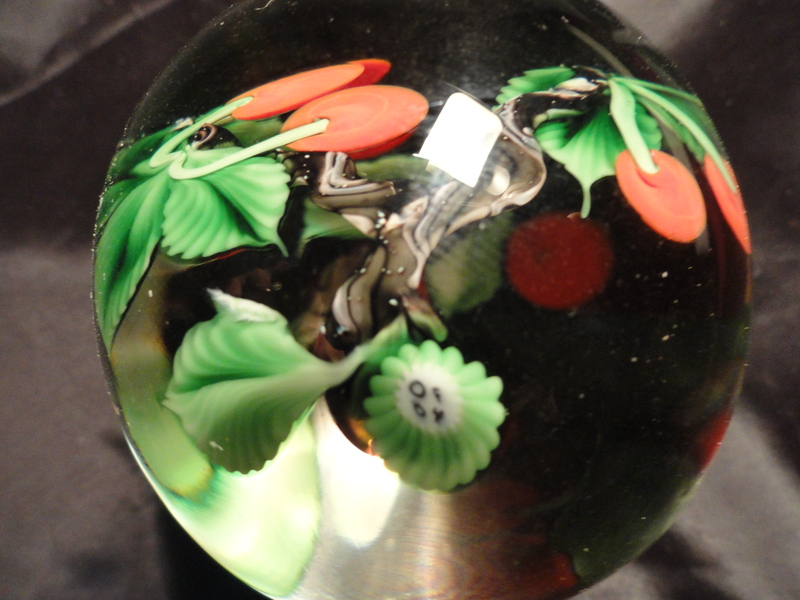 Categories Select Category Bought & Sold Levay Paperweights Paperweights Tobacciana Uncategorized What do you Collect?